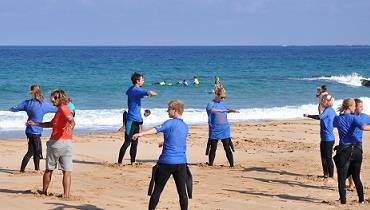 In our surf lessons Tenerife there are never more than 8 people. With that we can pay attention on every student and recognize mistakes immediately. So we guarantee you fast steps forward and you can use your stay in our camp optimal to improve yourself, extend your skills and reach the next level. You can choose between 14 or 24 surf lessons à 45 minutes. Even if theoretical basics are very important, the practical experience is in the foreground. Of course, you will get some information during the lesson that you understand the waves and your equipment. If you are not a beginner any more, but advanced we use our video-analysis to correct also little mistakes. You can use all the material – boards, wetsuits etc. – also outside the lesson and on the weekends. Furthermore we offer different levels with that you can improve your skills best: Beginner, Intermediate and Advanced. So you will learn with people who are on the same level. You want to jump in the water, dive into the world of surfing and stand on the board? That you will get the take-off soon, you will be taught in 24 hours (1 lesson is 45 minutes). First of all we make you familiar with water and waves, but you will also learn some basic facts about your equipment. We want you not only to feel comfy and safe in the water but we also want you to have fun and that you improve fast. We are long-year experienced and we know what matters in teaching. We will be extremely happy about your first “Take-Off”! 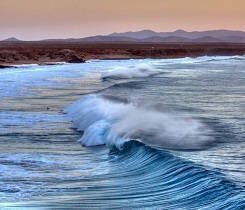 The theory lessons will also be crucial for your skills, with that we will give you an overview about waves, ocean and equipment. 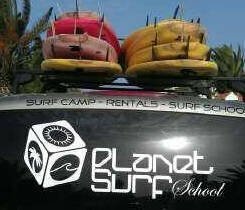 For those who exactly know what matters in surfing and know board and waves we offer an intermediate course. In 24 lessons we teach you how to surf green waves and maybe how to do your first turns. Of course, we don’t want you to rush. You can talk about your aims and expectations individually with your surf teachers. Green waves are your order of the day and you do not have problems with waves of 1,50m height, because you exactly know what to do – then you have just come to the right course! In our advanced course, which also has 24 lessons, we teach you the right technique to make turns. 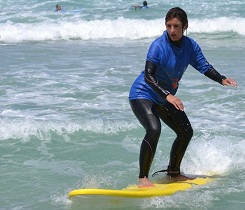 You will go surfing with our skilled surf instructors and you will get individual advices. The main goal is to perfect your skills!